Storytelling is the "mother" of all communications. Every art form relies on Story to convey meaning. Despite this truth, many communicators only approach storytelling as an adjunct to their speaking and presenting. For this quick article, I am speaking about oral storytelling, not digital storytelling that does not rely on or build on a presenter's public speaking skills. I suggest that mastering oral or traditional storytelling should be at the top of every speaker's list of priorities. 1. Storytelling teaches you to think on your feet. When you learn to be a good storyteller, telling stories to all sizes of audiences from 2 or 2000 people, you must learn to adjust your energy and pace to match the audience reaction. "Reading" or understanding the mood, energy, and desires of your audience is a good communication skill at all levels. 2. Storytelling teaches you to be spontaneous. While you are learning to tell a story, you focus on thinking about your story in an outline form, or episode-by-episode. Good storytellers do not memorize their stories word-for-word and do not use notes or other ways of reading their stories. No matter how you are communicating, it is never a good idea to deliver a canned, memorized speech to anyone. As a storyteller, you learn to rely on your ability to "see" a story as it happens, letting different parts of the story take precedence at different times. You will never tell a story the same way twice just as you should never speak to an audience like any audience before it. 3. Storytelling helps you to think about the deeper meanings of your content. Almost all stories carry some type of moral or ethical message and understanding. As you adapt personal and world stories to your presentations, you will start thinking deeper about the meaning of your communications. Of course, you may or may not act on those meanings, but you will generally find your presentations more satisfying as you understand their impact on your listeners. All cultures use storytelling. Storytelling is a universal language and a core-skill for all presenters. My best public-speaking tip: seek out learning and coaching in the art of storytelling and work stories into all your presentations. The official blog forK. Sean Buvala, storyteller and storytelling coach. How to Tell a Story? One of the most searched-for communication skills on the Internet is "how to tell a story." I would like to give you a quick step-by-step guide to this process of story telling, drawn from my 30+ years of being a professional storyteller. This is the fast and quick method to learn a new story. 1. Decide on a story. Sounds elementary, but at some point, you need to find a story that you love. If you are having problems, search the Internet for some simple Aesop fables or find some good stories at a site like Storyteller.net . 2. Break the story down into an outline of events so that you can remember the episodes of each story. You have two choices for step three. Do one or both if you would like. 3A. Write out or draw out the parts of the story. Using longhand, that means pencil and paper, write out the episodes of the story in your own words. Do not copy the story. Rewrite it in your own words. Doing this process by hand allows your brain to overcome any resistance you might have to the story. Knowing you can do this process with your story is also a way for your brain to overcome some fear of public speaking that might hinder you from telling this story. 3B. The other way to break down a story is via "storyboarding," a technique that many storytellers use. Take a letter-sized piece of paper. Fold it in half along the length. You now have an eleven inch piece of pager that looks like a taco. Then, fold the right side up against the left and then fold the same way again. When you unfold the paper you will have a piece of paper divided into 8 segments. Starting at the top segment, draw out each step of the story. This is only for you to learn so stick figures and bad drawings are just fine. This visual method may help you grasp the story better than writing alone. 4. Begin to tell yourself the story, aloud, using your own words while looking at one of the #3 tools above. Repeat this process several times. 5. Think about the story you are telling. Are there parts of the story that do not really need to be there? Do they drag down the story? Cross them off the list or the storyboard and tell yourself the story one more time with those parts of the story removed. Again, at each of these times, you are speaking your story aloud. Let your face get a feel for the story. 6. Put your notes down and tell yourself the story a few more times. This is a great exercise to do while you are driving your car or cleaning your house. Just keep talking to yourself. 7. Call up a friend or find an associate and tell them your story. Use no notes or storyboard. When you finish telling the story to your associate, ask them if it makes sense to them. Did they think you left out any parts? This is not the time to see if they "get it" or understand the deep meanings. You just want to know if the essential delivery of the story makes sense. 8. As your confidence in the story grows, you will want to start thinking about the emotions represented by different words in the story. You may find that you wish to emphasize one part or character over another. These things come with time. If you feel better about saying "once upon a time" at the beginning or "the end" as one of your story endings, then do so. As you grow to understand storytelling even more, you will learn so many other ways to start or end a story. 9. When it is time for your story's debut, be confident. Look at your audience. Speak clearly. Slow down and enjoy the story experience. As a professional storyteller, I can tell you that it takes a dozen or more tellings of a story to find the your true rhythm and delivery for each story. There you have it, how to tell a great story! This is a quick, get-it-now guide to storytelling. There is so much more you can learn about how to tell a story. Remember- get started today telling stories. Like a painter who must paint often to get better at painting, you, too, must speak stories often and to many groups in order to improve. Here's a brand new, eight-minute video on using gestures in storytelling and public speaking skills. We are thinking about making a series of storytelling techniques videos. Storytelling for teens? Storytelling for business? This is a prototype we assembled here in the office. (I said "we" like I have a monkey in shirt pocket. )YouTube of course botches the quality of these things but you can see a High-Quality version at YouTube or I can get you the 1.7 Gig version if you want it. Don't watch it in full-screen. Eww. Have fun watching. It was fun to make. Any of you video production people want to joint venture with me on a project? Ahem. Storytelling Techniques in an Eworkbook from an Experienced Storytelling Consultant. Would you like to start learning storytelling techniques- right now? Wow! 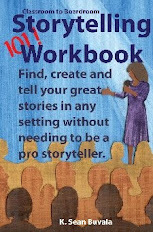 We've relaunched the "Storytelling 101" Workbook as an Ebook project. You now get immediate access to the workbook in a an immediate download. I am so happy about this new facelift to this project. I have been a storytelling coach for a few decades and I understand what people want and need from a storytelling consultant. I've packed these exercises into this workbook and you can be learning from me in just a few minutes. In addition, you get a chance to pick the brain of storytelling trainer: ME! Buy the book and you get free telephone story coaching with me. There are also two storytelling teleseminars included in the kit once you register your purchase. I am very proud of how we could put this "storytelling consultant" idea into a downloadable Ebook. Please come learn more at http://www.storytelling101.com. Your purchase is backed by a one-year 100% promise of satisfaction. Thanks for your time. Come get my book. We've got this priced right now at an amount that I won't be able to offer for long. By the way, you can get a free storytelling Ecourse from me. Just look over there in the sidebar to sign up. The Ecourse is not nearly as in-depth as the Ebook of storytelling techniques, but you'll still learn a bunch- and at no cost. At noon (AZ time) every day, Monday through Friday, I post a a storytelling tip or concept. I have to be very succinct to get it to 120 characters. The other 20 characters are take up in the title. Come follow me on Twitter to get these mini ideas. I am having much fun with them. My user name is @storyteller . Storytelling in Business Podcast: Storytelling is Not a Soft Skill. The next episode of our "Storytelling and Narrative for Business Podcast" is ready for you! Episode Four: "Storytelling is Not a 'Soft Skill': Sure Looked Easy"
Sean brings you some tough-love this week to help you understand that storytelling is a "hard skill" for your business. Fail that understanding and things can go bad. Get real coaching and training to sharpen your skills. Find all the podcasts in this series on this page here. Sponsored by: Executive Speaker Training Workshops. Over at Kathy Hansen's excellent blog, A Storied Career, she posted a very popular video that's floating around the Internet. It's a visual explanation of the financial crisis. I truly enjoy Kathy's blog and think she's one of the few quality and consistent bloggers for storytelling out there. It's a great video experience. It's a way to understand a complex subject. It should be seen by many people. It's something that I am glad that I watched. It's something that deserves attention. It doesn't need to tagged as storytelling to make it valuable. It stands well on it's own as a powerful video that serves a good purpose. It has value as art in its use of video. If everything is storytelling, then nothing is storytelling. A hammer is no less a valuable tool just because it's not a screwdriver. This video doesn't have to be storytelling in order to still be excellent. Kathy, you have illustrated the a real issue: Just what is storytelling? For me, storytelling takes people. I have videos on YouTube of me doing storytelling, but the videos are *not* storytelling. They are video records of my storytelling and they pale by compare to the video quality and technique of the above video you posted. We do a disservice to both storytelling expertise and video expertise by not treating each to its own unique charism and definition. I can talk about the financial crisis by retelling (speaking) the stories of others or using world tales to illustrate the meaning. A program of these stories, used to frame the video above, would be a powerful evening of conveying an idea through the dual communication methods of storytelling and video. If I had to attach a shelf to a wall, I would have different tools to choose from based on how I wanted the shelf attached. I could use a hammer, screwdriver or glue gun, for example. Each is a different way of getting to the same goal. If I had to talk about the financial crisis, I could choose different tools based on how I wanted the audience to understand the issue. I could use oral storytelling, writing, video or dance. Each is a different way of getting to the same goal. I shall stop rambling now. Let's stop calling all communication storytelling. Let's recognize that there are many ways to get a message out and storytelling, the one-to-one even-in-a-crowd oral technique (or ASL), is one very exciting way. Let's not dilute everything into one single pool called storytelling. Let's value the many ways to express story. Having practiced and taught the art of storytelling for many years, I think it's the most effective and cost effective way to communicate. However, I know that all art forms (video included) are equally important contributors to the conversation. By the way, add Kathy's blog to your regular reading. It's that good.